Six Flags Over Texas is no longer flying the Confederate flag pictured here, to the left of the American flag. This picture was taken prior to Aug. 18, when Six Flags took it down. Six Flags is no longer flying the Confederate flag. Six Flags Entertainment Corp (SIX), which owns 20 amusement parks in North America, removed the Confederate flag on Friday from the three parks that were still flying it, two in Texas and one in Georgia. 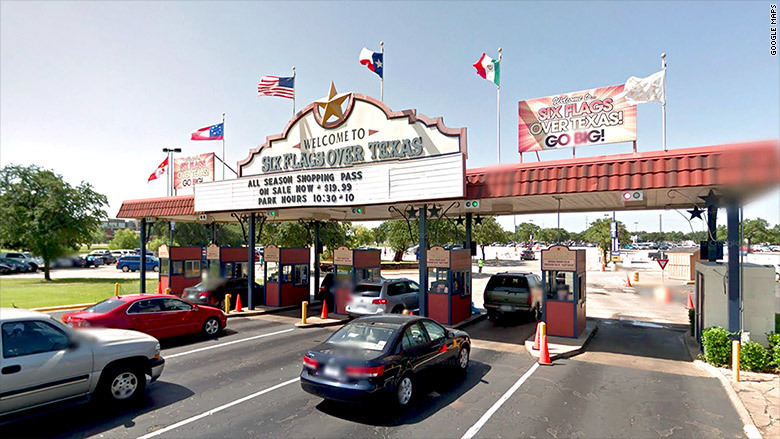 The Confederate flag was removed from Six Flags Over Texas in Arlington and Six Flags Fiesta Texas in San Antonio, and from Six Flags Over Georgia outside Atlanta, the company said. "We're just choosing to display symbols that everyone can support, that being the American flag," Six Flags spokeswoman Sandra Daniels told CNNMoney. "We're flying all American flags." She said that some parks were flying their state flags, as well. Six Flags was founded by Angus Wynne, who established the flagship amusement park, Six Flags Over Texas, in 1961. He wanted to have a flag for every country that represented Texas throughout its history, including the United States, the Confederacy, Mexico, Spain, France and the Republic of Texas. The company did not explain its decision, but Confederate statues are being taken down across the United States after the violent protests in Charlottesville, Virginia, a week and a half ago. White nationalists, some waving Confederate flags, converged there to protest the removal of a statue of General Robert E. Lee. One attendee was charged with killing a counter-protester, Heather Heyer. 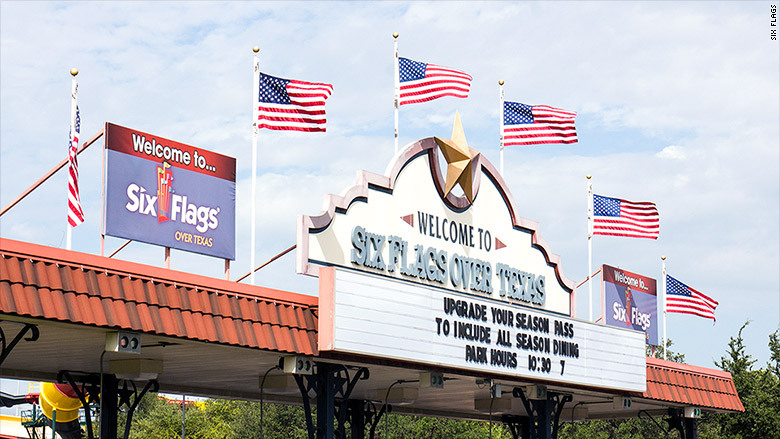 Six Flags Over Texas took down the Confederate flag on Friday and is now flying only American flags. Confederate flags and monuments also came down in 2015, after Dylann Roof murdered nine parishioners at a historic black church in Charleston, South Carolina. In July 2015, South Carolina legislators voted to remove the Confederate flag from the Statehouse grounds. The Confederate flag flown at Six Flags was what was known as the Stars and Bars, with a circle of stars representing the rebel states. It was not the more recognizable red flag with the blue cross with white stars, known as the Confederate battle flag or Tennessee battle flag. Six Flags has 17 parks in the U.S., two in Mexico and one in Canada.